When it comes to advise, spubs only act upon it if it suit them. All Praise is for Allah Lord of the Worlds, and may honour and peace be upon the Noblest of the Prophets and Messengers, our Prophet Muhammad, and upon all his Family and Companions. 1. Fighting extremism (Al-Ghuluw) in all its forms, whether in the form of extremism for personalities or others like da’wah institutions, and that matters must be weighed according to the Islamic legal scales. It is not permitted for anyone to put themselves forward to teach and deliver lectures until they become qualified in their knowledge and until the required legitimate authorization is issued to them, either from Islamic universities or known sheikhs under whom they have studied and become qualified in Islamic sciences. The brothers are not permitted to issue rulings to people because they are not from the qualified people of fatwa. It is upon them to refer the fatwa to the scholars amongst the sheikhs so that they can give them verdicts and then the brothers can circulate these fatawa or send them to the people concerned if the fatwa is private. It is upon them to maintain precision, honesty and responsibility in this regard. 5. The brothers are not considered teachers who (themselves) are fulfilling the duty of education when they read the books of the scholars in which the latter have explained some (religious) texts; rather they are only conveying and translating the words of the scholars in explanation of these books. It has been made clear to him that what he wrote was a clear error and in contradiction to what the hadith scholars, who are the real ‘People of Al-Jarh wa Al-Ta’deel’, are upon; not as the claimants and foreigners to this noble science say. When this became clear to him he admitted his error in this regard – Allah reward him well – and this is the duty of all of us when our mistakes become clear to us. Thereafter he was made to understand that he must clarify his mistake and circulate his retraction. 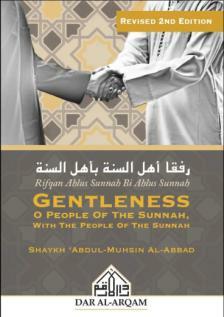 It is upon the brothers to adhere to this way because ‘gentleness is not placed in anything except that it beautifies it and gentleness is not removed from anything except that it spoils it’ as the Messenger – sall Allahu ‘alaihi wa sallam – said in the authentic narration. It is incumbent to refer to the scholars on this issue and to present any issues of this nature to them; they then will give the ruling as regards who deserves to be boycotted and who does not. 10. In closing, we advise them with Allah’s instruction to us all, as it was His instruction to those who came before us, that being: the instruction to fear Allah jalla wa ‘azz, and to be conscious of Him privately and publicly, outwardly and inwardly. We say to them, “Know that Allah comes between a man and his heart”, and no subtlety is hidden from Him, glorified be He. One of the clearest signs of this consciousness of Allah and fearing him is that their call to the people should be sincerely and purely for Allah jalla wa ‘allaa, its goal being to guide people to the truth – not to themselves. So their goal should not be to dominate others or to gain leadership over them, as was stated by Shaykh Al-Islam Muhaamd b. Abd Al-Wahhab – Allah have mercy on him – in commentary of the statement of Allah Most High, “I call to Allah upon knowledge and insight.” Shaykh Al-Islam Ibn Abd Al-Wahhab said, “This verse points out that a person should maintain ikhlas (sincerity and purity of intention), for although many people involve themselves in da’wah, they only do so calling to themselves,” or words to that effect. May Allah honour and send peace and blessings upon His most devout worshipper and Messenger, our Prophet Muhammad, and upon his Family and Companions and all those who follow them be_ihsan , wa al hamdulillah Rabi al a’alameen. and our brothers in SP, see Attachment a copy of this baiyan in arabic with the Signatories. This baiyan was written on last Friday 9th April 2005.